One of the trends in the current Semantic Web community and also something that is starting to gain traction in the World Wide Web is the notion to publish data in the open in a structured form (e.g. see Opening Up Government or Linking Open Data projects). 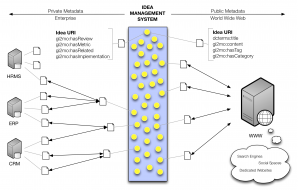 In our recent research we have put most of our effort into applying Semantic Web technologies for internal corporate systems, however we would also like to advocate publishing (parts) of structured Idea Management data into the open. With the implementation of metadata annotations as proposed by Gi2MO this costs very little additional effort but surely the question is: what benefits can it actually deliver and how could it work? Link and reference idea data in other platforms. Publishing data in the open can enable other systems (e.g. social networks) to use and reference information like ideas from a particular Idea Management System in a much more rich way then just simple URL linking. An example of how it can be successfully used for business is Facebook Opengraph and the “Like” feature. A small example of how open data could be used in idea management for referencing information has been already shown by us in a blog post as well as published in the apps section. Improve positioning and visibility in the search engines. Although publishing web metadata (either Semantic Web or other standards) cannot be considered as a popular activity it is certainly known that its usage is strongly researched by search engine companies. One of the proposals that could potentially provide a winning argument for publishing metadata is its influence on how search results are rendered. In comparison to regular results the websites enriched with metadata have rich snippets that display more and better information (e.g. 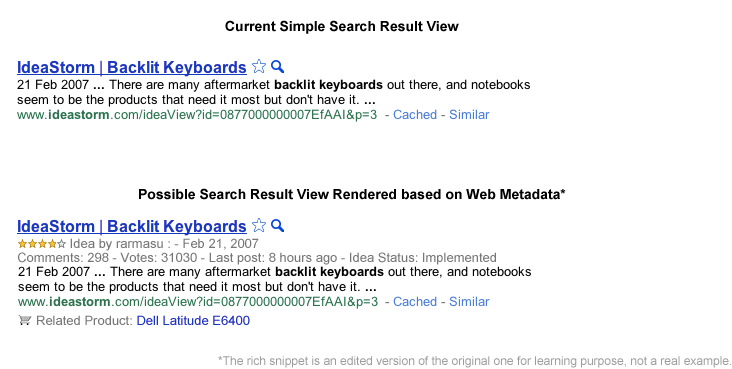 rich Google snippets or in the past Yahoo SearchMonkey). 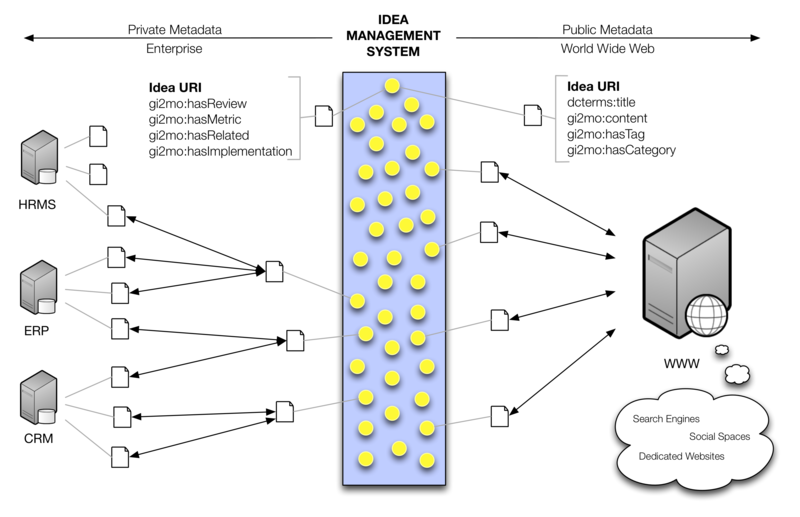 For Idea Management indexing particular ideas and their metadata could lead to more attractive presentation in search engines thus increasing popularity and views number (see a concept how it could look like). Creative usage of data in dedicated desktop and web applications. Planning and carefully steering the usage of data can bring good results but practice and history of Internet shows that often communities and individual people discover and popularize datasets and services in ways that their original creators could never dream of. One of the currently popular examples of this is creating mashups based on open data and APIs.